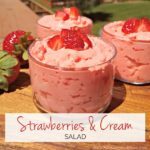 STRAWBERRIES & CREAM SALAD - Juicy strawberries paired with a creamy vanilla base. An easy make-ahead dish for any occasion. Combine strawberry jell-o mix, vanilla pudding mixes and hot water in a large saucepan. Bring mixture to a boil, stirring frequently. Continue boiling (and stirring) until mixture turns clear. Pour into dish or bowl and chill until set. I usually make the night before and chill overnight. Add diced strawberries immediately before serving. Stir gently to combine. Instant pudding mix will not work with this recipe.